Glioblastoma multiforme, a type of brain tumor, is one of the most difficult-to-treat cancers. Only a handful of drugs are approved to treat glioblastoma, and the median life expectancy for patients diagnosed with the disease is less than 15 months. MIT researchers have now devised a new drug-delivering nanoparticle that could offer a better way to treat glioblastoma. The particles, which carry two different drugs, are designed so that they can easily cross the blood-brain barrier and bind directly to tumor cells. One drug damages tumor cells' DNA, while the other interferes with the systems cells normally use to repair such damage. "What is unique here is we are not only able to use this mechanism to get across the blood-brain barrier and target tumors very effectively, we are using it to deliver this unique drug combination," says Paula Hammond, a David H. Koch Professor in Engineering, the head of MIT's Department of Chemical Engineering, and a member of MIT's Koch Institute for Integrative Cancer Research. Hammond and Scott Floyd, a former Koch Institute clinical investigator who is now an associate professor of radiation oncology at Duke University School of Medicine, are the senior authors of the paper, which appears in Nature Communications. The paper's lead author is Fred Lam, a Koch Institute research scientist. Building on prior work from Floyd and Yaffe on the DNA-damage response of tumors, the researchers packaged temozolomide into the inner core of the liposomes, and in the outer shell they embedded an experimental drug called a bromodomain inhibitor. Bromodomain inhibitors are believed to interfere with cells' ability to repair DNA damage. By combining these two drugs, the researchers created a one-two punch that first disrupts tumor cells' DNA repair mechanisms, then launches an attack on the cells' DNA while their defenses are down. The researchers tested the nanoparticles in mice with glioblastoma tumors and showed that after the nanoparticles reach the tumor site, the particles' outer layer degrades, releasing the bromodomain inhibitor JQ-1. About 24 hours later, temozolomide is released from the particle core. The researchers' experiments revealed that drug-delivering nanoparticles coated with transferrin were far more effective at shrinking tumors than either uncoated nanoparticles or temozolomide and JQ-1 injected into the bloodstream on their own. The mice treated with the transferrin-coated nanoparticles survived for twice as long as mice that received other treatments. "This is yet another example where the combination of nanoparticle delivery with drugs involving the DNA-damage response can be used successfully to treat cancer," says Michael Yaffe, a David H. Koch Professor of Science and member of the Koch Institute, who is also an author of the paper. "Our goal was to have something that could be easily translatable, by using simple, already approved synthetic components in the liposome," Lam says. "This was really a proof-of-concept study [showing] that we can deliver novel combination therapies using a targeted nanoparticle system across the blood-brain barrier." 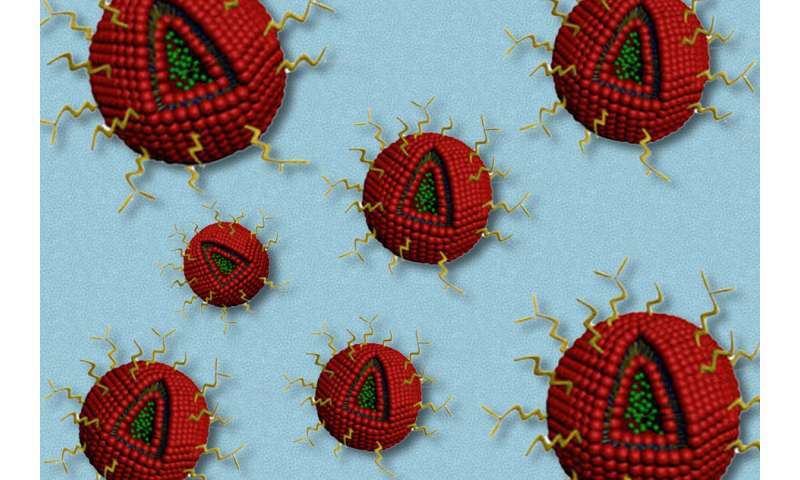 The researchers anticipate that this type of nanoparticle delivery could also be used with other cancer drugs, including many that have never been tried against glioblastoma because they couldn't get across the blood-brain barrier. "Because there's such a short list of drugs that we can use in brain tumors, a vehicle that would allow us to use some of the more common chemotherapy regimens in brain tumors would be a real game-changer," Floyd says. "Maybe we could find efficacy for more standard chemotherapies if we can just get them to the right place by working around the blood-brain barrier with a tool like this." Very exciting news. Sadly this combination is not ready for human trials until a better substitute can be found for JQ-1. But the technique for delivering drugs across the blood-brain barrier is important progress by itself. Love it! I believe we're well on our way to an effective tool against glioblastoma.